20 lives shaped by the arms trade. See their world through your eyes. NORTH AMERICAN PREMIERE – ALL ERFORMANCES SOLD OUT! 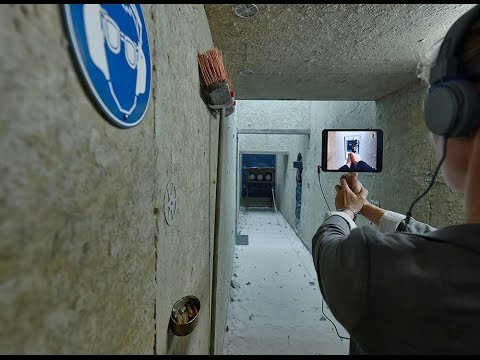 Equipped with an iPad mini and headphones, an audience of 20 follows a range of real-life characters: an Israeli soldier, a Swiss weapons manufacturer, a Pakistani lawyer or a Mexican drug cartel administrator, with the help of a screen used to augment reality. Situation Rooms is an award-winning multi-player video installation inspired by real photos of the American government upon learning that their mission to kill Osama Bin Laden had been successful. Slipping into the perspectives of the protagonists, the audience becomes entangled in a film set that recreates the globalized world of pistols and rocket-propelled grenades, assault rifles and drones, and rules and refugees – a part of the re-enactment of a complicatedly elaborate, multi-perspective “shooting” in an immersive environment with more than 4,000 props. Germany’s Rimini Protokoll use theatre and technology to create unusual perspectives on our reality. Led by writer/directors Helgard Haug, Stefan Kaegi, and Daniel Wetzel, the group work around the world and are currently touring eight different performance pieces. Their piece Best Before was presented by Luminato in 2010 at the Berkeley Street Theatre. Situation Rooms has been presented around the world and makes its North American premiere at Luminato. By Jutta Brendemühl | Situation Rooms has taken Rimini Protokoll’s work to yet another level of post-dramatic shock and awe. A photo flashes onto screens around the world. It shows 13 people in a room. The expressions on their faces speak volumes: triumph, fascination, scorn, horror, scepticism, preoccupation. The photo from the White House “Situation Room” documents the end of a manhunt that was pursued with all possible weapons. Situation Rooms gathers together 20 people from various continents whose biographies have been shaped by weapons, in a film set that recreates the globalised world of pistols and rocket-propelled grenades, of assault rifles and drones, of rulers and refugees, becoming a parcours of unexpected neighbourhoods and intersections. The audience gradually becomes entangled in the film set’s spatial and material labyrinth, each individual becoming part of the re-enactment of a complicatedly elaborate, multi-perspective “shooting”. Winner of the Excellence Award of the 17th Japanese Media Arts Festival in Tokyo on February 5, 2014. How to research and cast documentary plays, and how to involve the audience in such projects. Stefan Kaegi will share his insights into the making of recent Rimini Protokoll projects, and brainstorm and develop some experiments around upcoming projects including Top Secret International, which deals with the production and trade of information in a globalized world. Rimini Protokoll is gathering life stories of spies, secret carriers, politicians, journalists and activists from over 30 countries. What strategies do they have? Which allies and enemies will they make? To register for the workshops send an email with your resume and a brief paragraph about your interest to workshops@luminato.com.